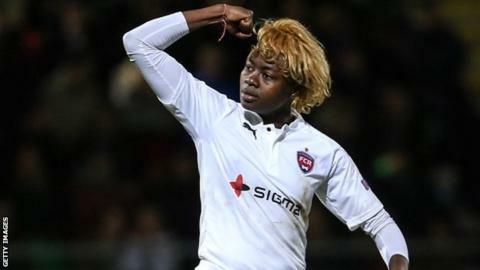 Uefa has opened a disciplinary case after claims Frankfurt fans racially abused Rosengard players during their Women's Champions League quarter-final. The referee's report said the Swedish side's forward Gaelle Enganamouit was abused, with the official stopping the game in order to restore control. Frankfurt won the tie on penalties with the case due to be heard on 5 April. "If it was racist, it's very disappointing," Rosengard and England defender Anita Asante told BBC Sport. "It's an important thing that Uefa have decided to investigate it. It shows they are taking it seriously and they don't really want it to become the part of the women's game. "It's not so usual that it happens, I've never really experienced a situation where this has become such a hot topic." Anita Asante's last England appearance was in 2014 and said a lack of contact from boss Mark Sampson had been "difficult"
Asante, who says she was not abused, said she assumed Cameroon international Enganamouit and Brazil's former world player of the year Marta were booed during the second leg of the tie in Germany because of their talent, only learning afterwards that the incident was allegedly race-related. She was also unaware of Marta reportedly confronting a fan but admits she was confused when the referee stopped the game for what "felt like a long period of time". "There were large number of fans who were booing aggressively, but nothing in terms of words that I could understand," said Asante, who does not speak German. "The referee stopped the game, spoke with some officials and we continued the game as normal, unaware of what was going on." Despite losing the tie on penalties, Asante said she was against Frankfurt being thrown out of the Champions League. The four-time winners have been drawn against fellow German team Wolfsburg in the semi-finals. But Asante, who has 70 England caps, said: "If the allegations are true, it's the responsibility of Uefa to address Frankfurt, their staff and the club as a whole and make sure they put in penalties to make sure supporters are penalised for their behaviour and don't have the opportunity to do it again. "Everybody should work to eradicate discriminatory behaviour from the sport. We don't want what's occurred on a wide scale in the men's game to trickle into the women's game. "As much as possible we want to avoid situations where it becomes a serious issue."